All baseball and softball hitting methods fall entirely under the top level of Contact depth. Learn the different mechanics required to hit each contact depth; you’ll possess the skills to build a high batting average and hit for power. The Multi-Swing Method is a hitting philosophy developed by Clinton Balgera, the inventor of the Laser Power Swing Trainer Power Hitting Aid; morphing to your baseball or softball swing. Therefore, you can hit any way you decide, using your preferred method. 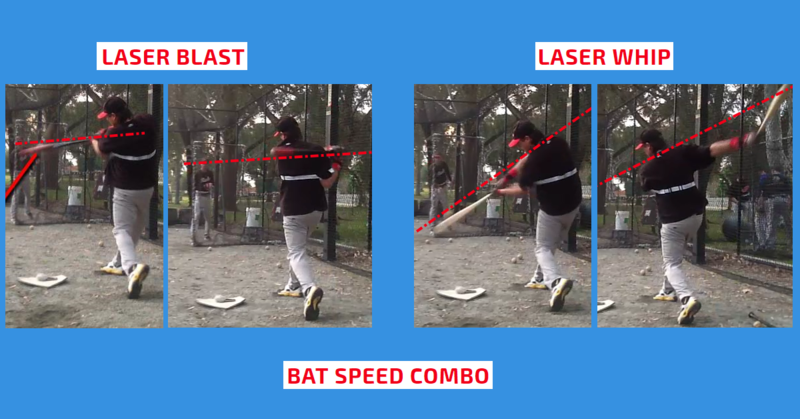 Both arms inserted inside your Laser Power Swing Trainer power hitting aid. Explode with your hips to improve bat speed, and rotation. The back foot is a great key performance indicator for correct rotation, aim to be spinning fast on the toes of your back foot. Minimize head movement, making contact closer to your body. Hit the ball back up middle or the outfield gaps. Utilize a 2-hand grip follow through. Maintain a flat bat plane for the high and deep ball. Avoid trying to lift on your follow through as you’ll fight your natural swing path causing issues with your head pulling off the ball and falling off balance. Ensure you don’t roll over at the point contact. Rolling over at contact will cause the barrel of your bat to rise and as a result you’ll hit the top of the ball and that’s what causes topspin line drive or a ground ball swing. Beyond the point of contact whip the bat around your body and roll the wrists during your swing follow through. Failure to roll the wrists reduces bat speed, and cuts off your follow through. 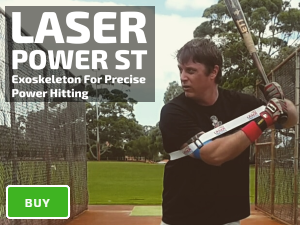 Back arm inserted inside your Laser Power Swing Trainer power hitting aid. Follow your natural swing path, with an extended and low contact zone whip the bat with a higher top-hand release follow through. Explode with your core while staying in your legs, keeping your head in the center of graving. Develop your approach, hitting the ball up the middle or opposite field alley. Option to use a lighter bat to allow for more whip on an extended contact zone.